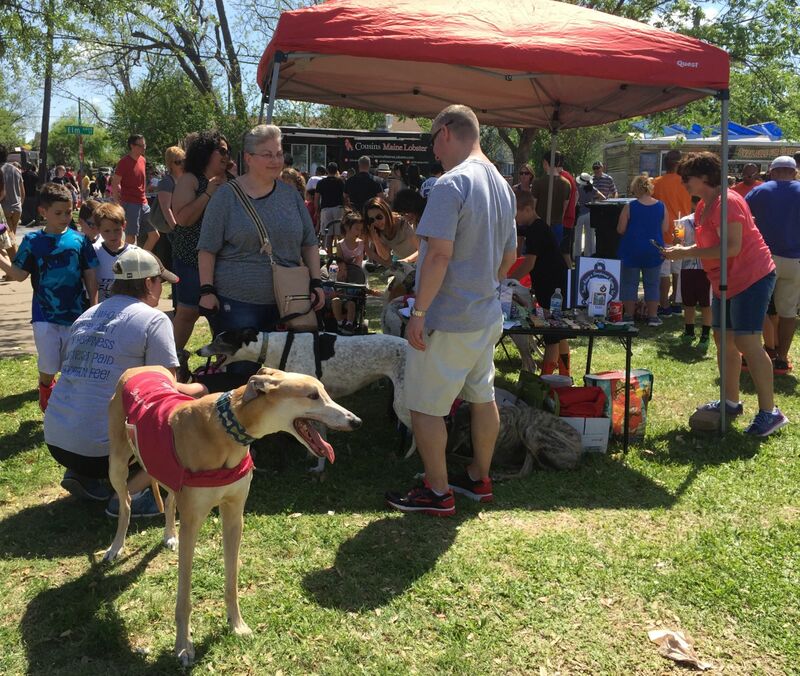 Although TAGS will not have a booth at this event, please bring your dogs and enjoy the event and take in all the wonderful art for sale. 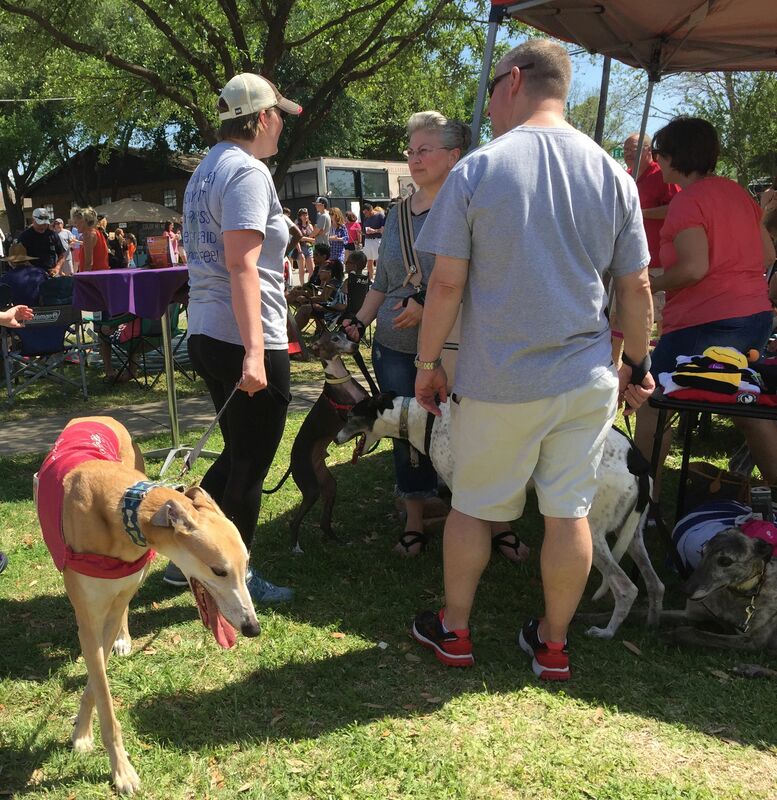 We are sure you will see other Greyhounds there!! 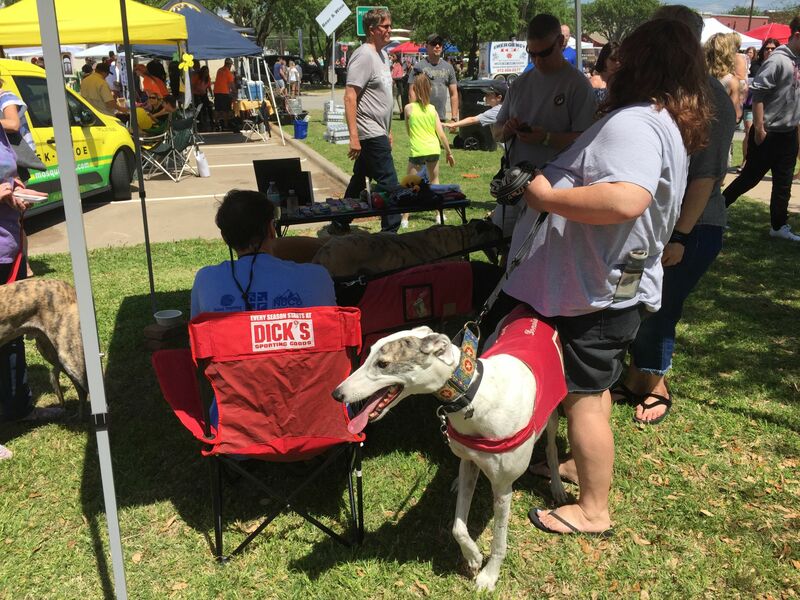 Bring your Greyhounds and browse through all of the merchandise booths, listen to live music, and choose food from the food trucks galore! 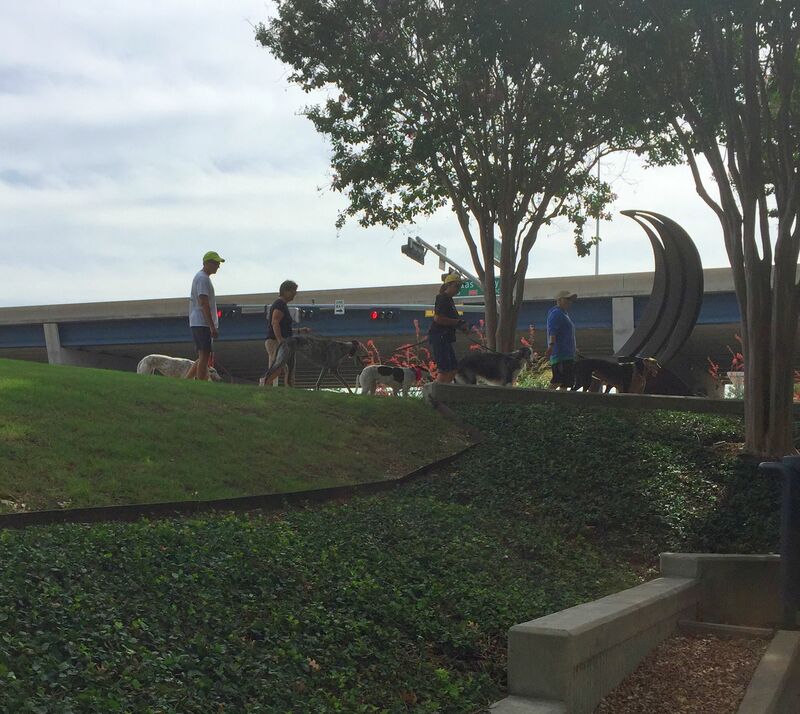 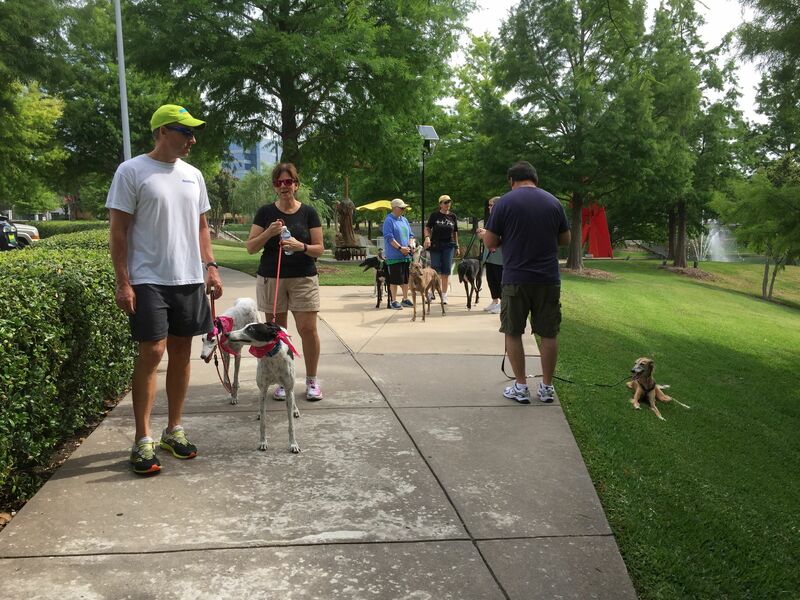 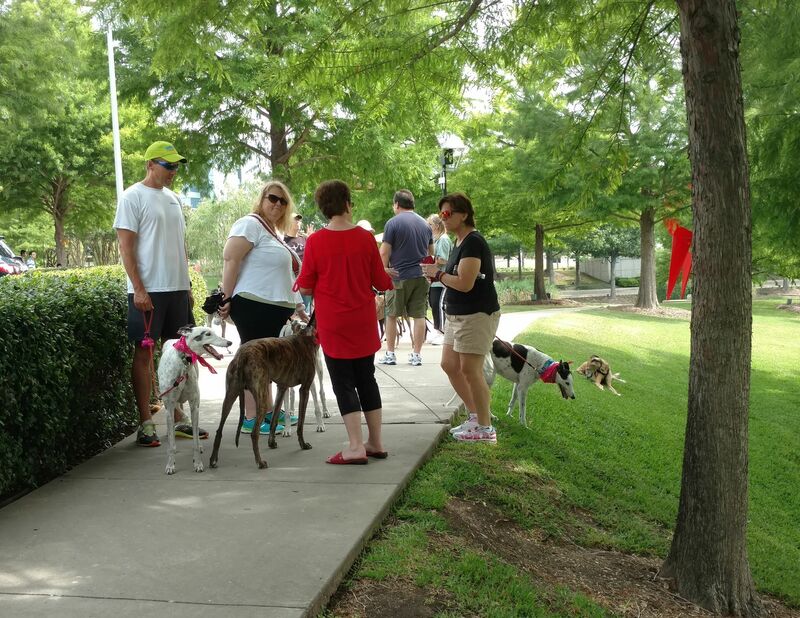 Let’s celebrate Memorial Day by walking our Greyhounds at Hall Office Park. 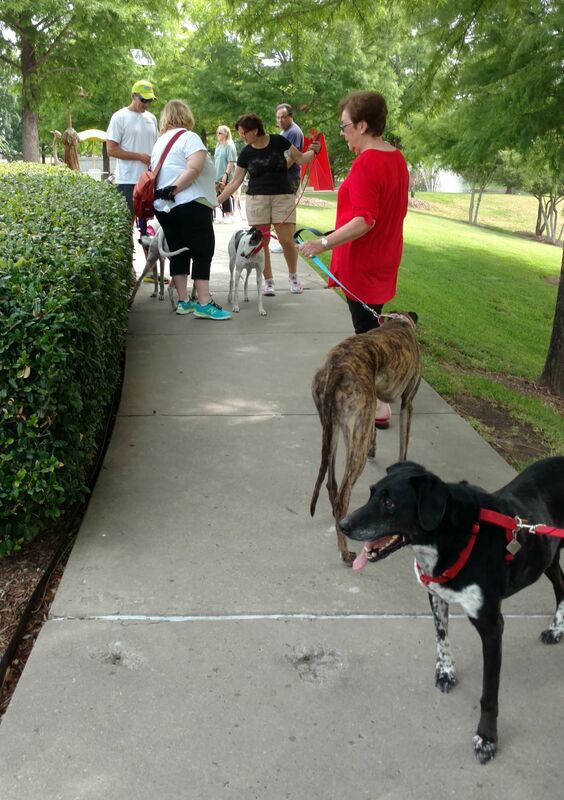 Celebrate Greyhounds by walking with lots of people and their Greyhounds. 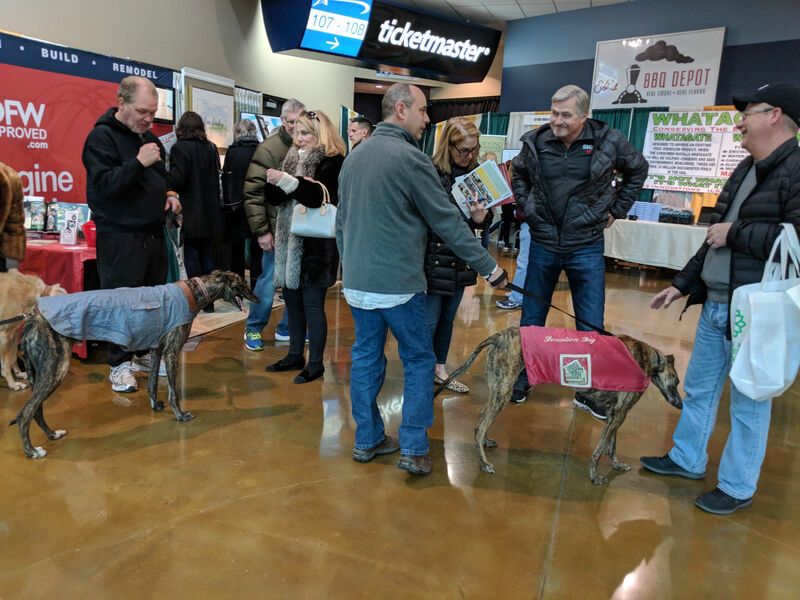 Saturday and Sunday, February 10 and 11, 2018 - 2018 Spring Collin County Home & Garden Show: TAGS’ volunteers braved the cold weather (you never know if it will be 40 degrees or 70 degrees) for the 2018 Spring Collin County Home & Garden Show. 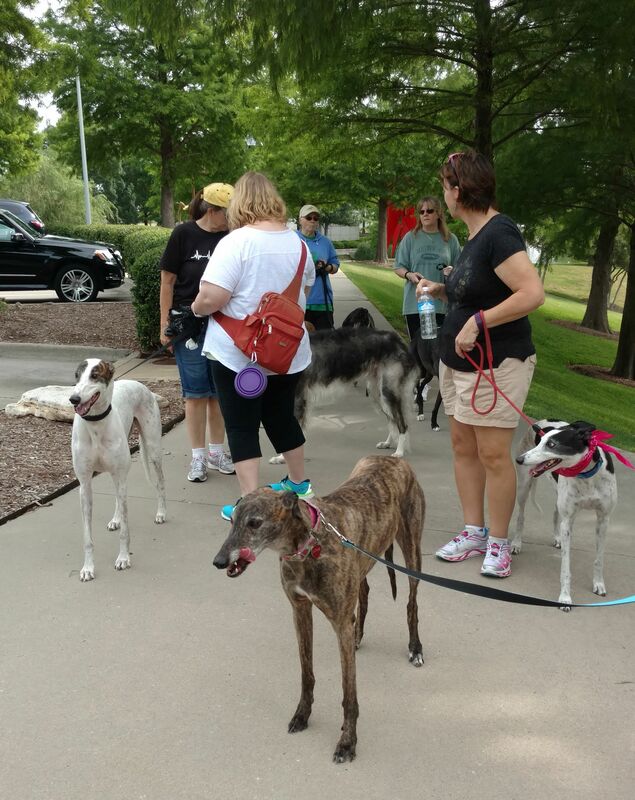 We had a greyt turnout this time. 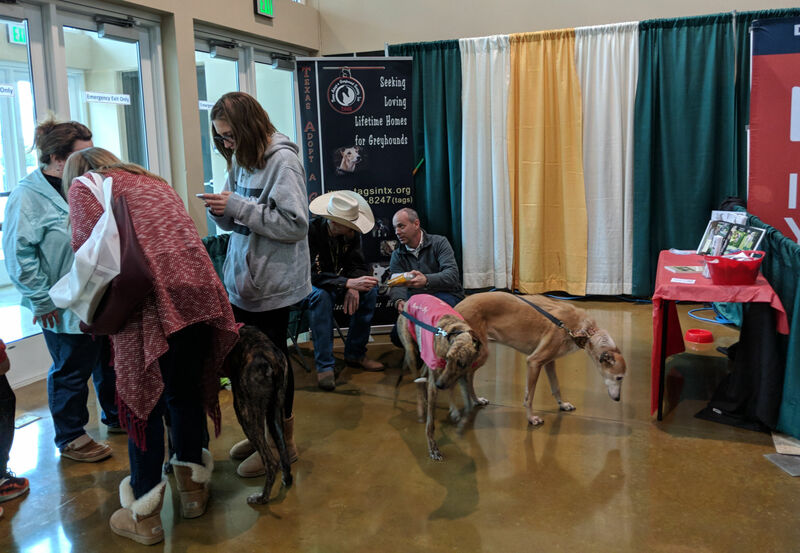 All adoptable Greyhounds made an appearance, and quite a few of adopted dogs came as well. 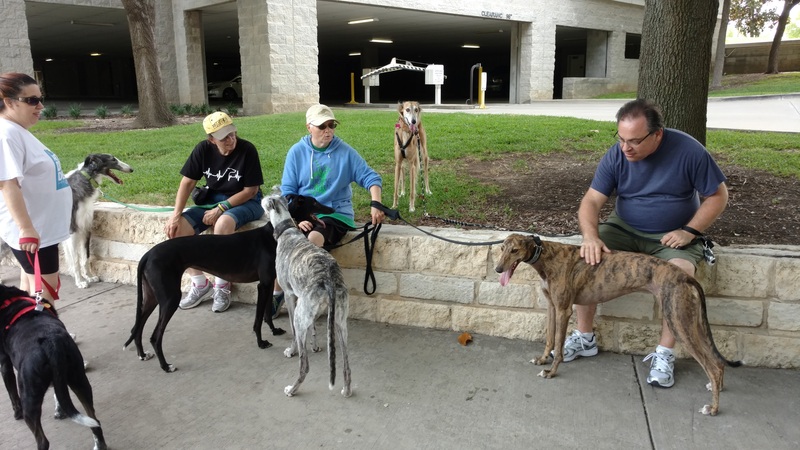 It is always good to see happy adopted Greyhounds. 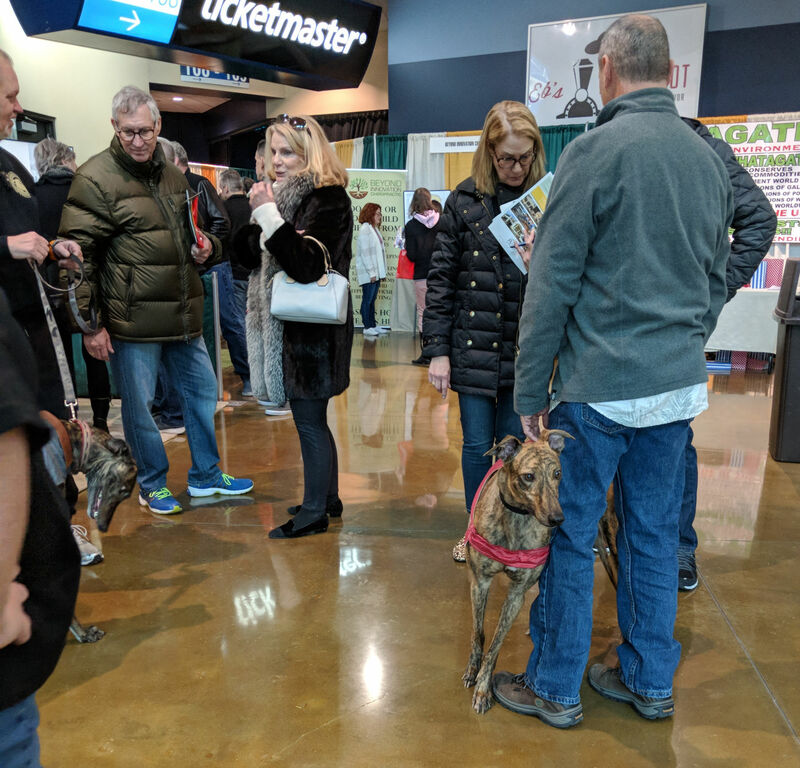 Thanks to all the volunteers for making this another successful show. 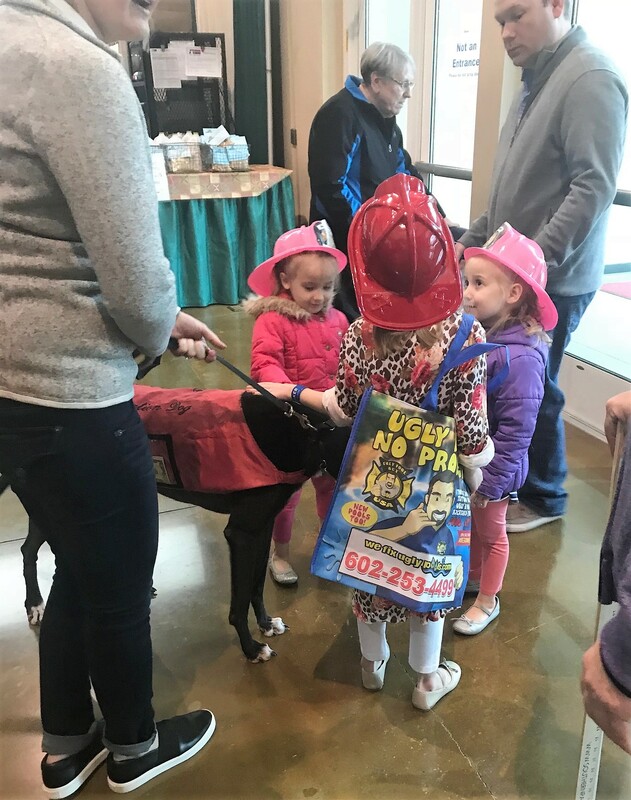 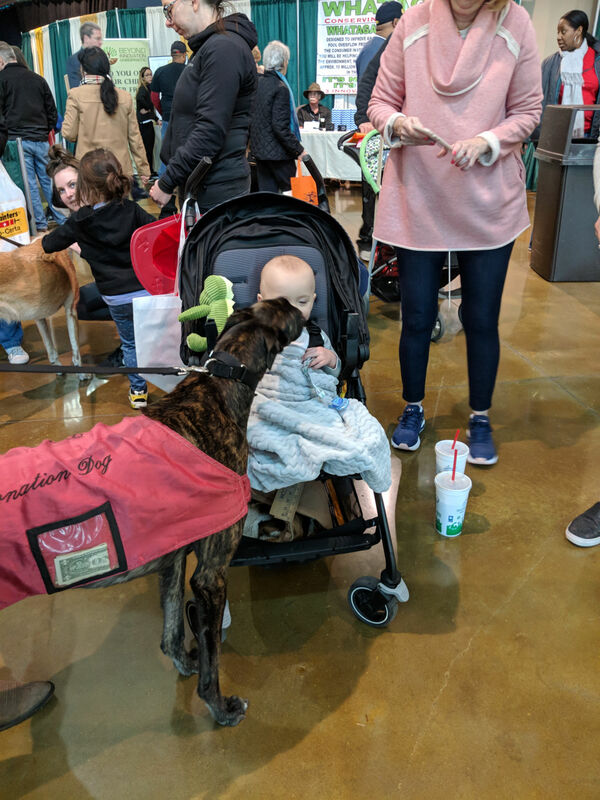 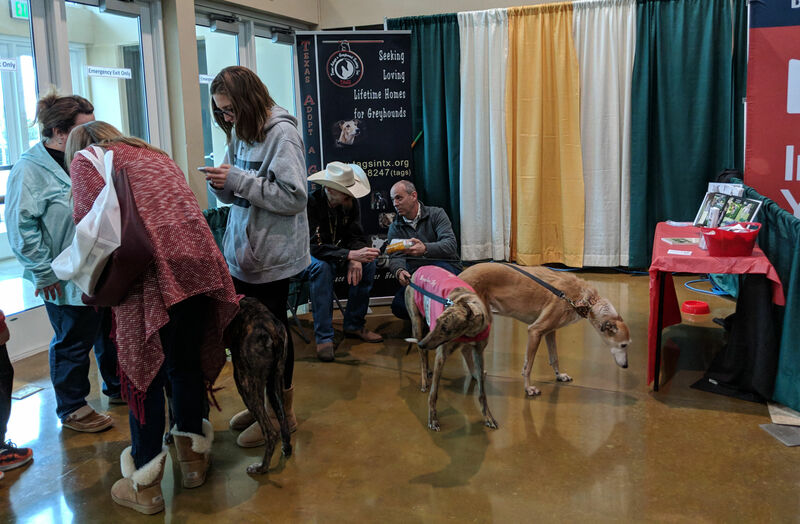 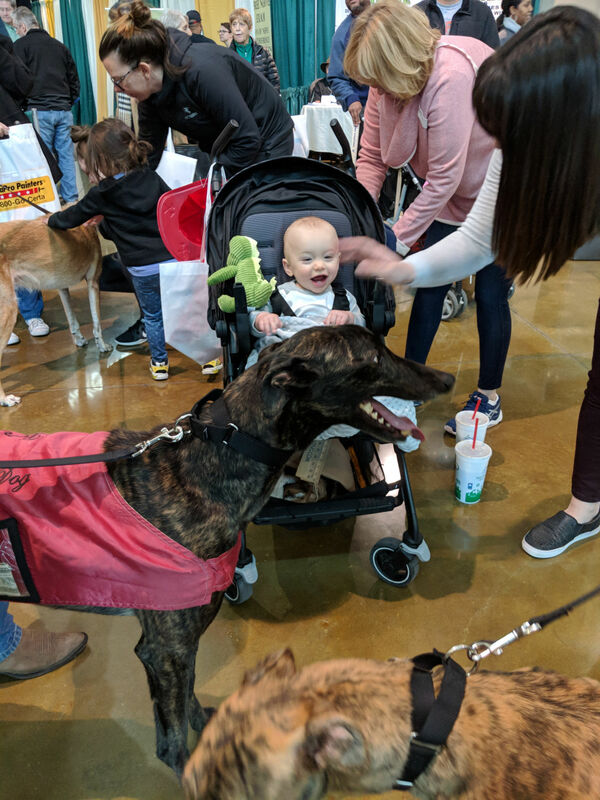 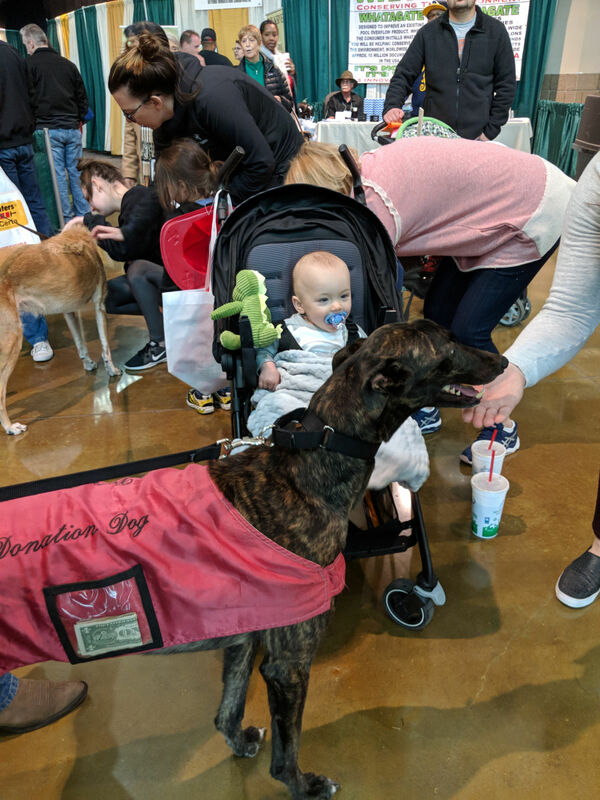 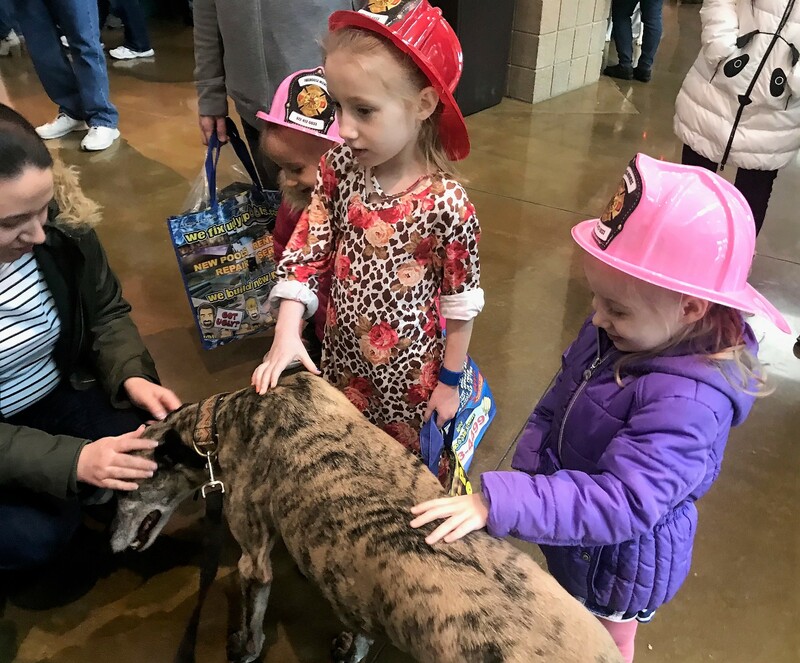 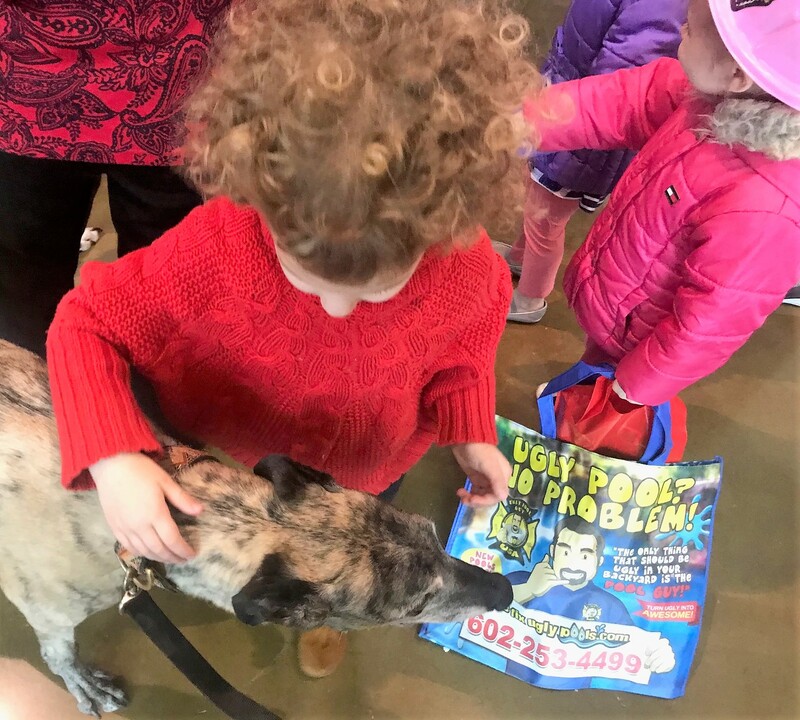 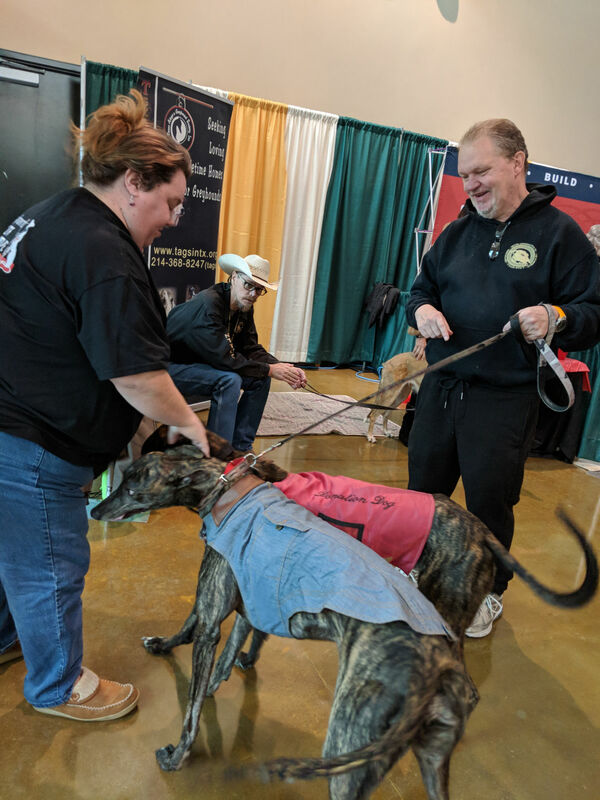 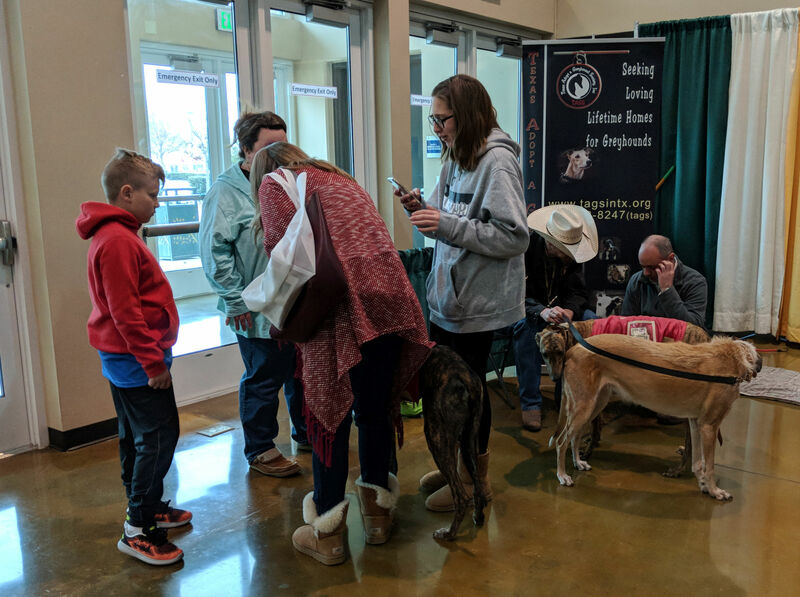 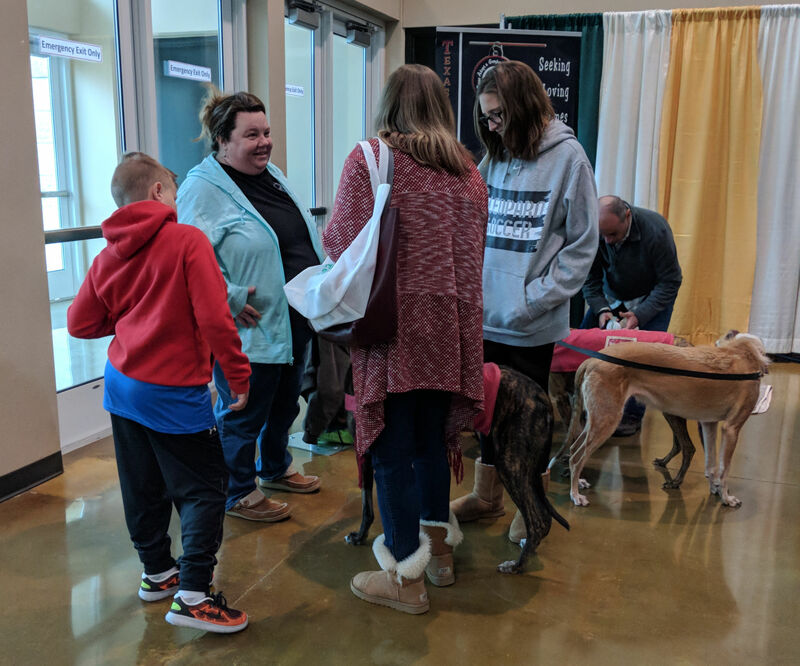 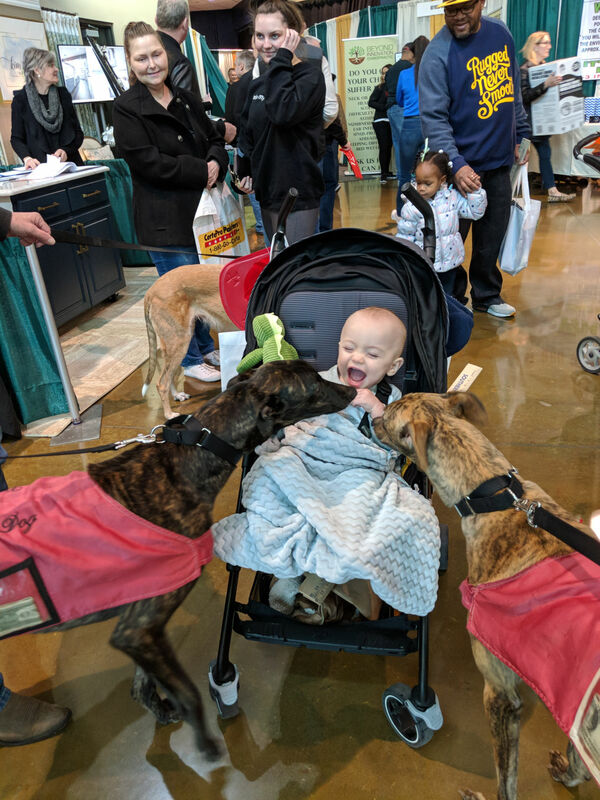 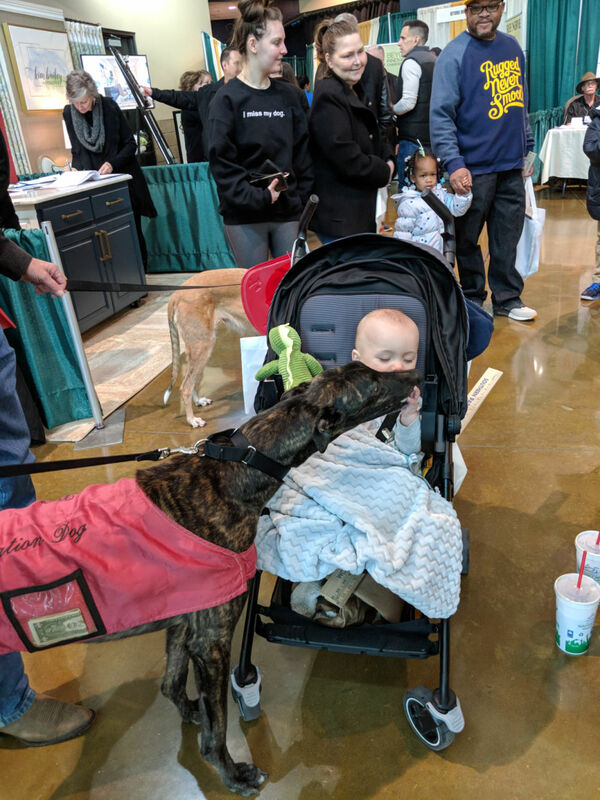 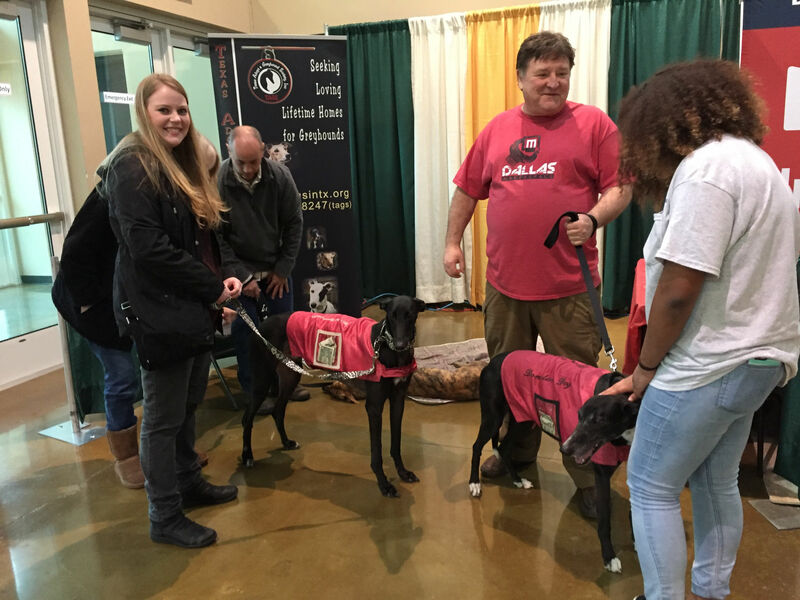 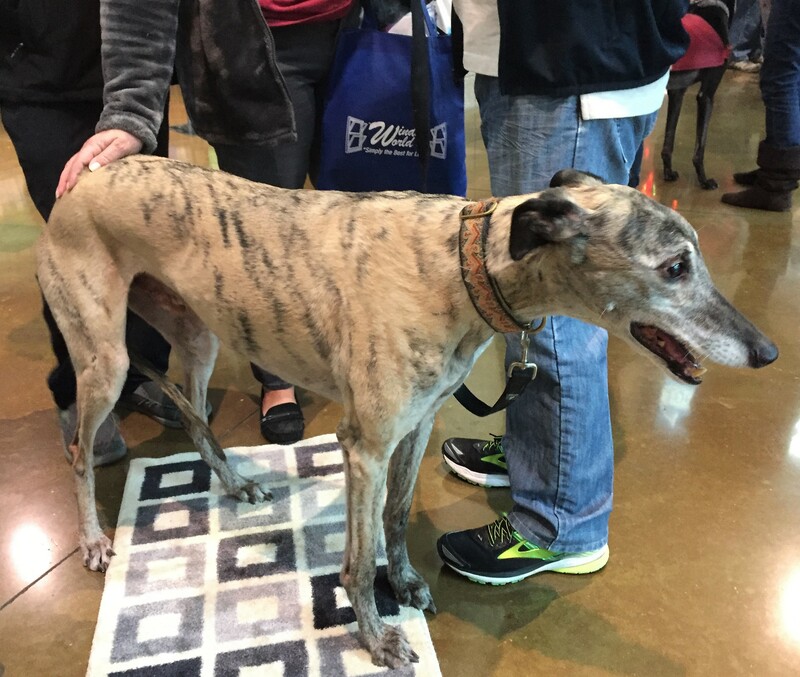 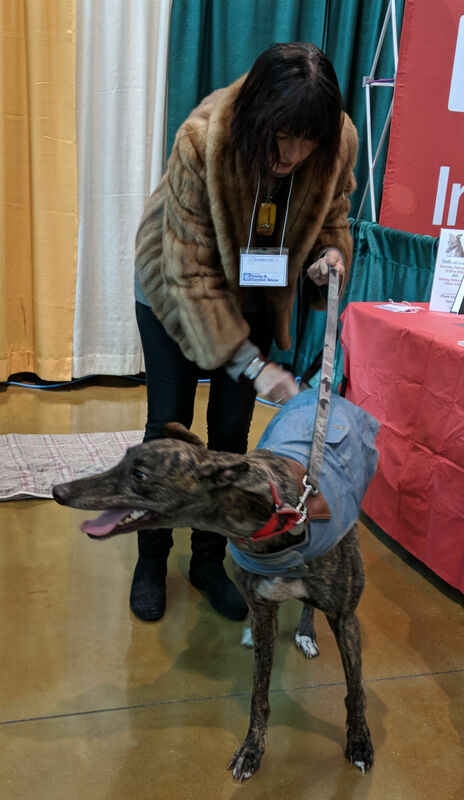 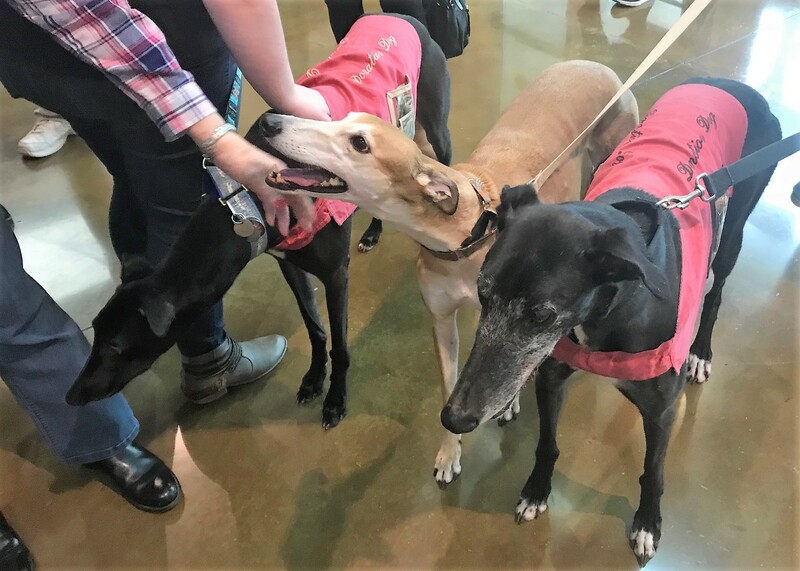 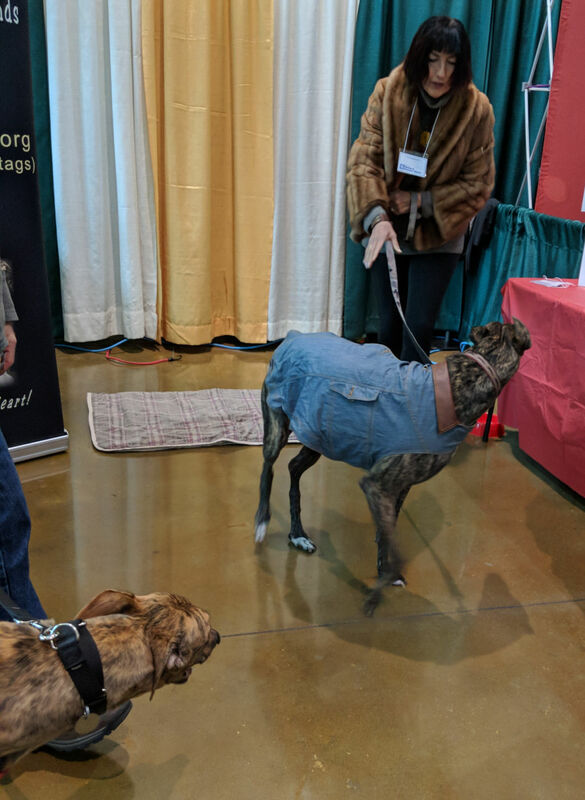 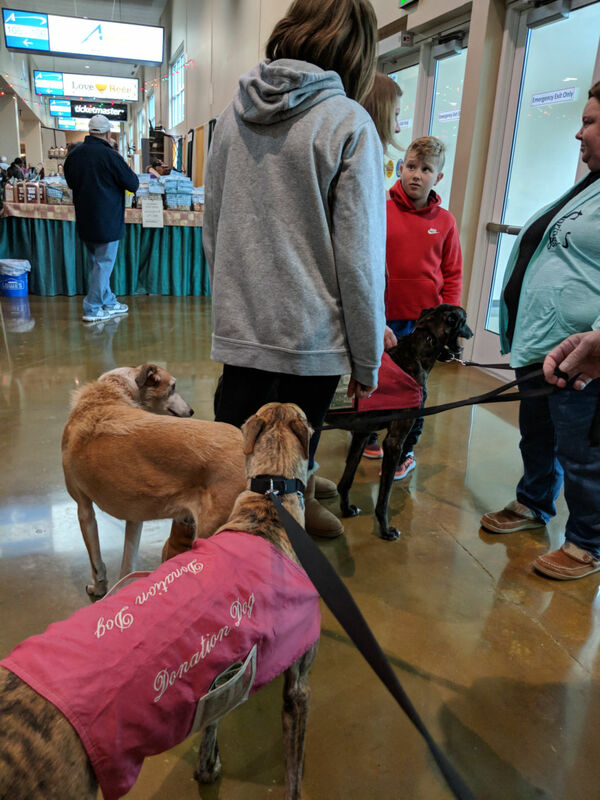 Saturday and Sunday, September 16 and 17, 2017 - 2017 Fall Collin County Home & Garden Show: TAGS and the Greyhounds helped usher in Fall again at the Collin County Home and Garden Show this past weekend (even though it still feels like summer). 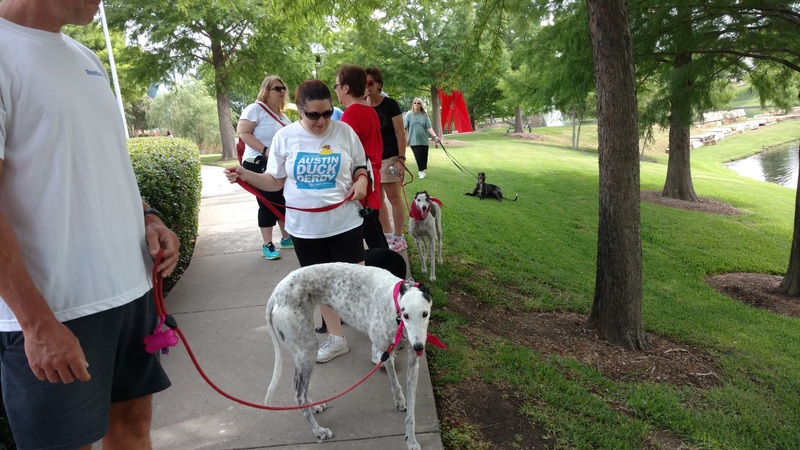 Thanks to all who participated and helped raise awareness for the Greyhounds. 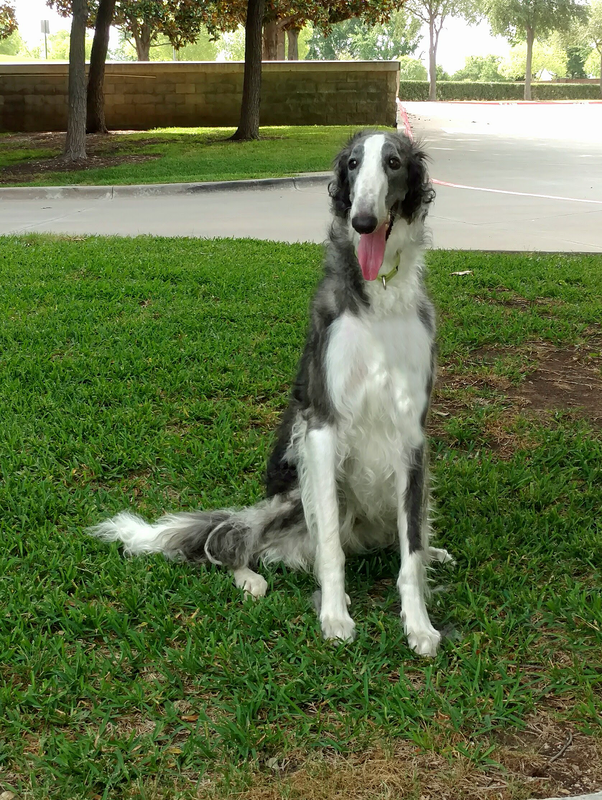 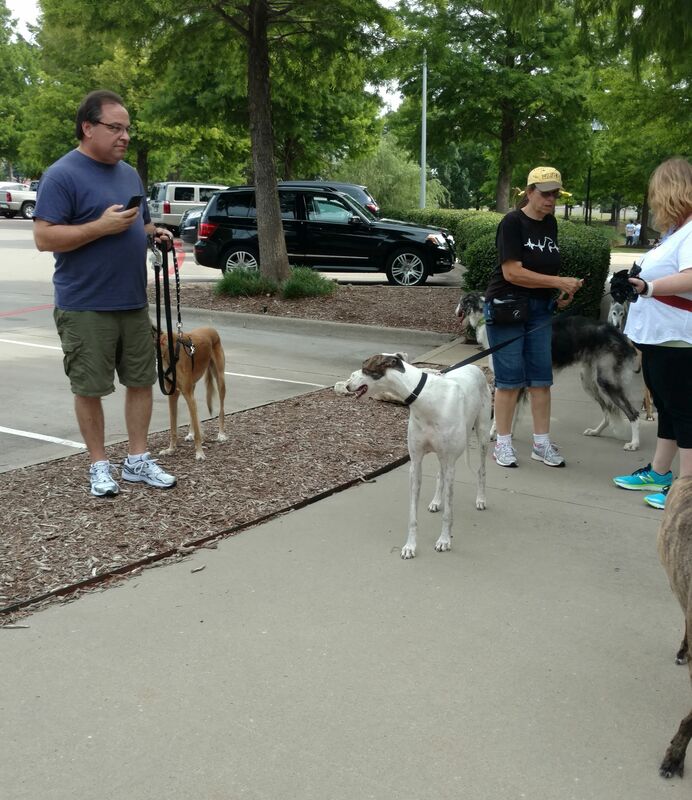 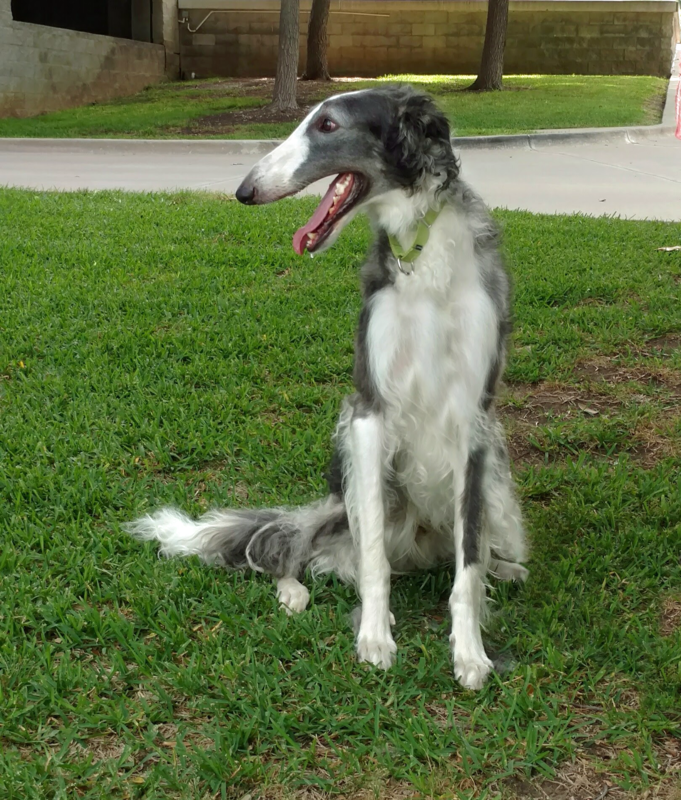 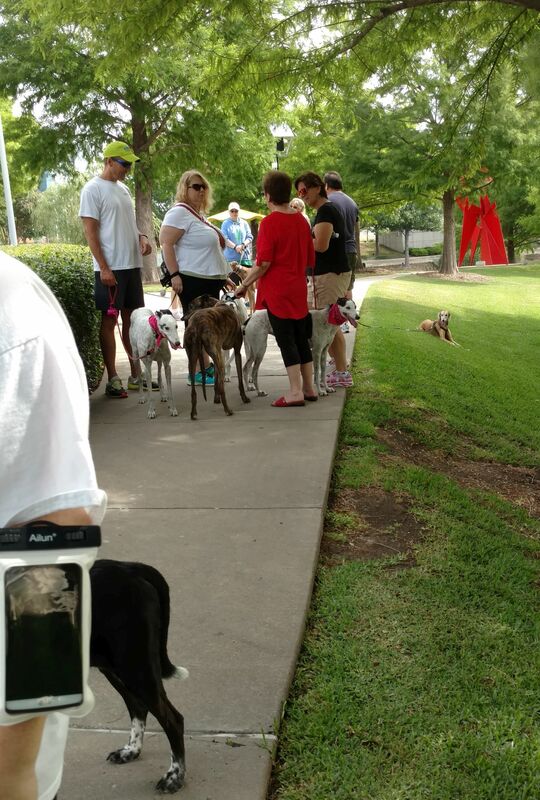 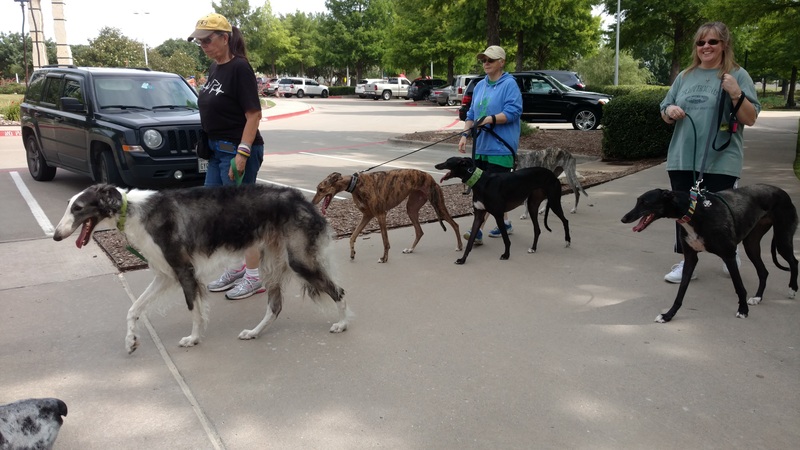 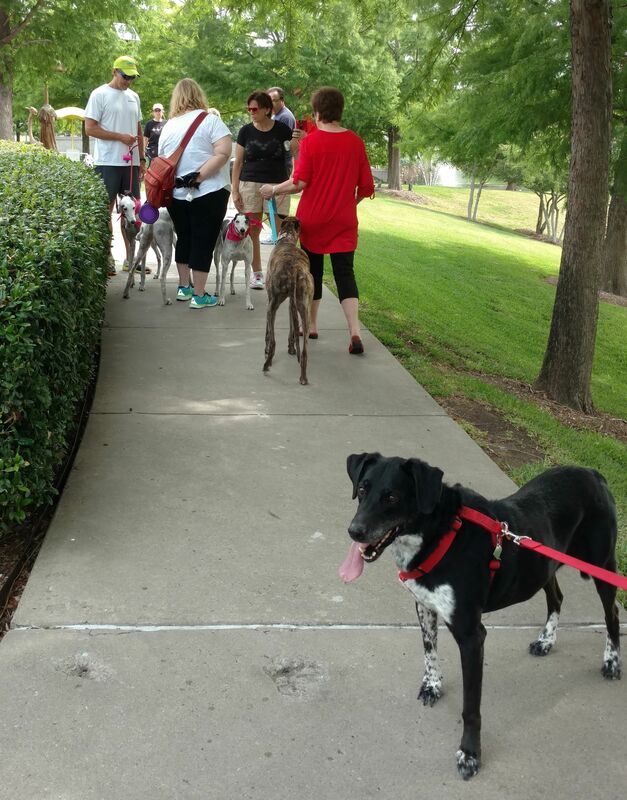 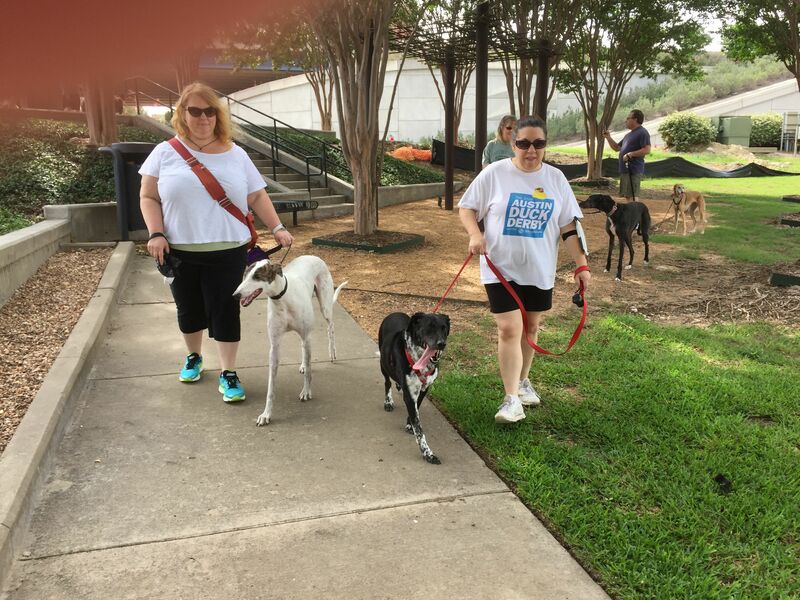 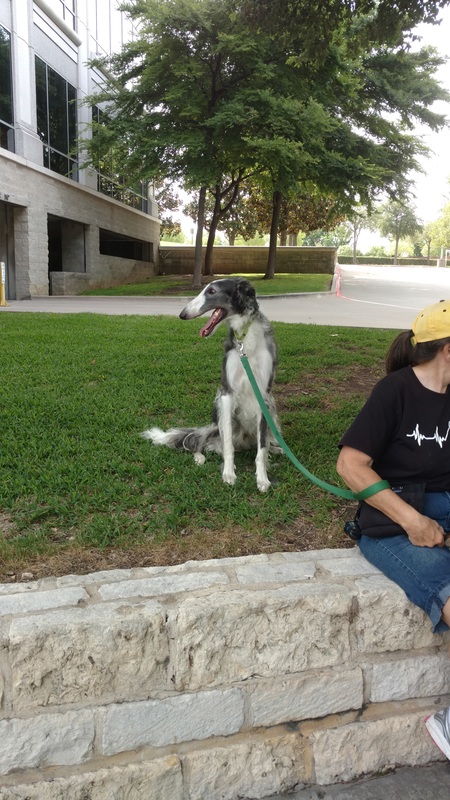 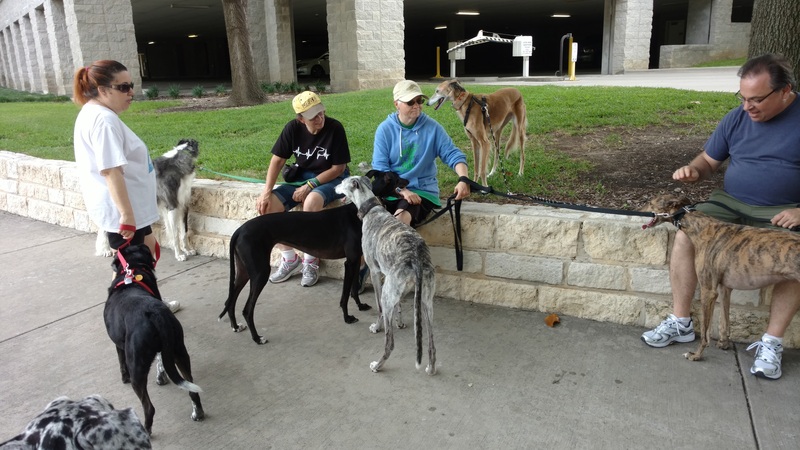 Monday May 29, 2017 - Memorial Day Walk with TAGS - Hall Office Park: TAGS again had a fun walk this year with Greyhounds, including 14-year old Diana, plus a Borzoi, Great Dane, Greyhound/Deerhound mix, Saluki and Pointer/Lab mix at Hall Office Park in Frisco. 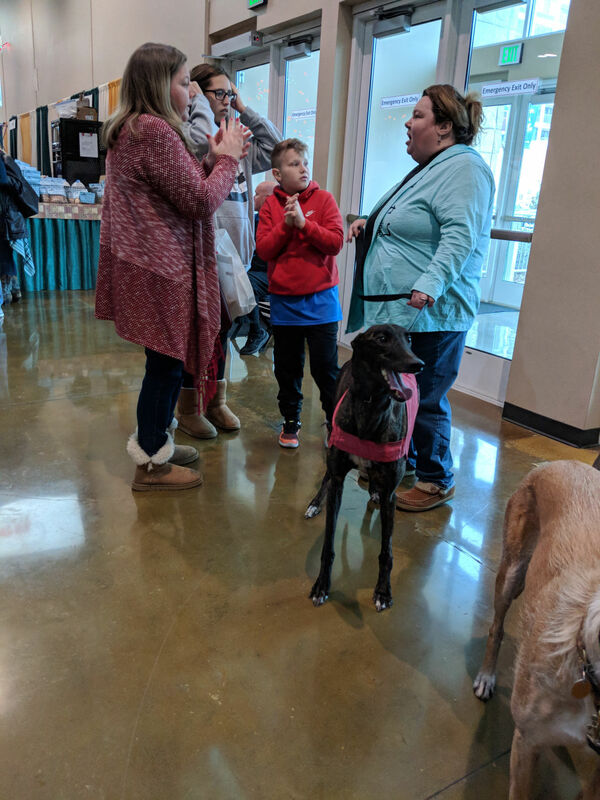 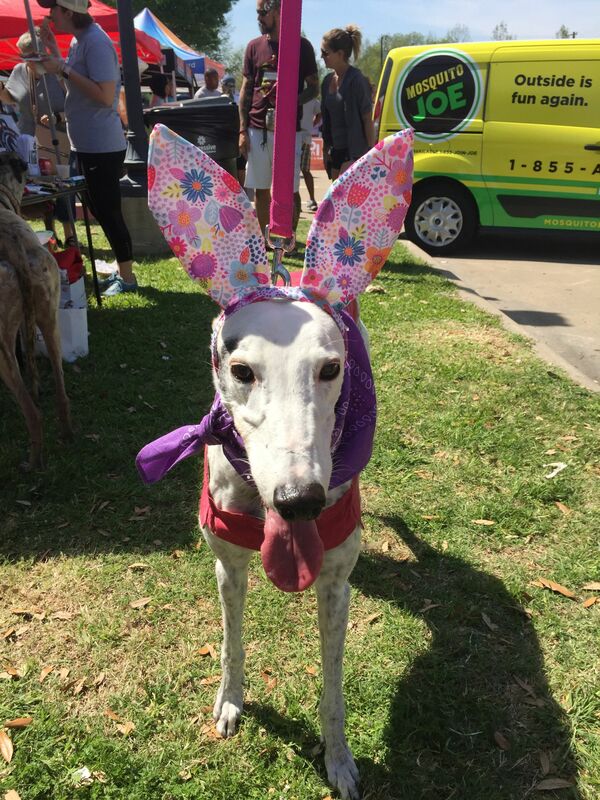 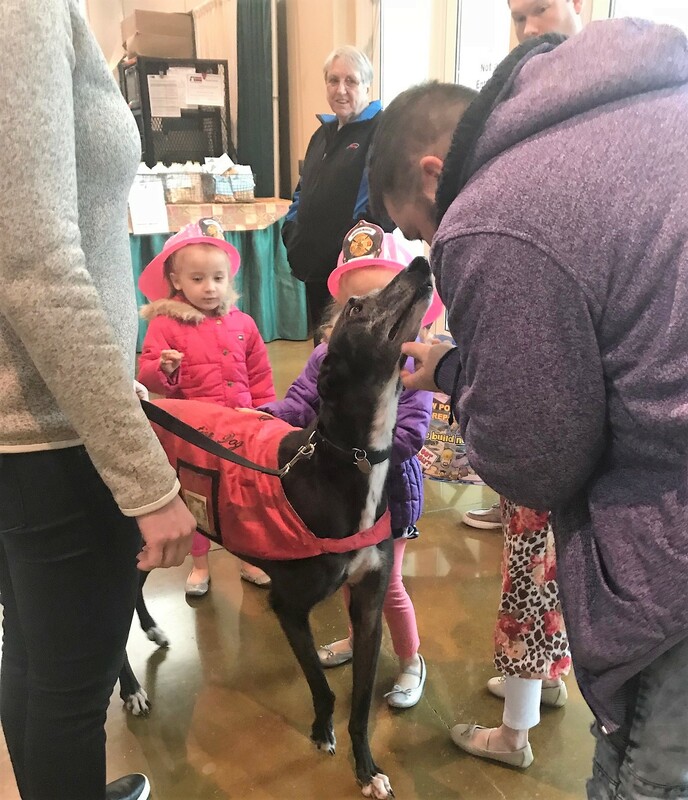 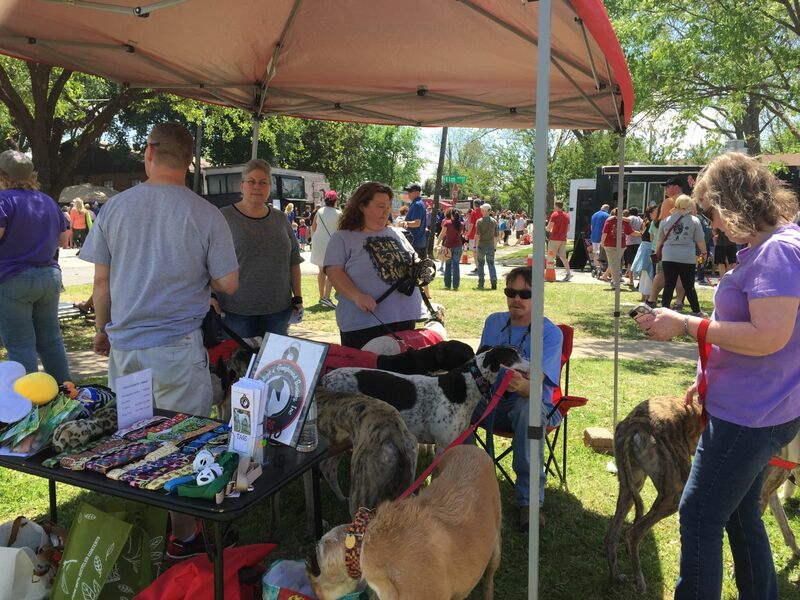 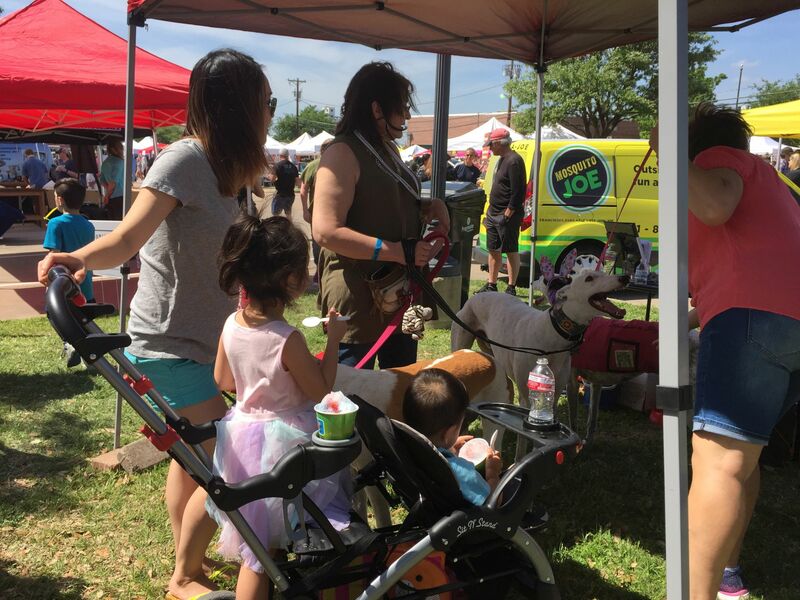 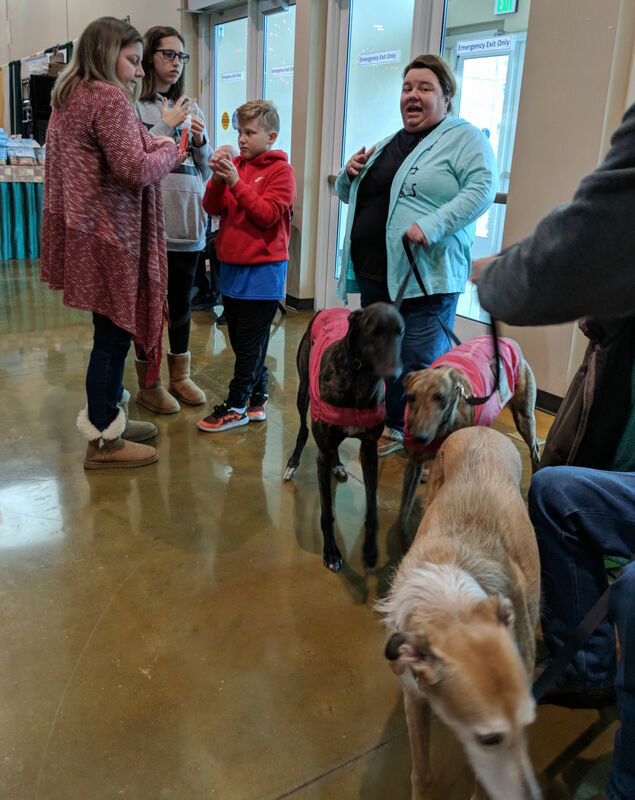 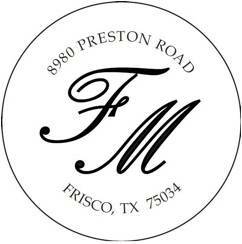 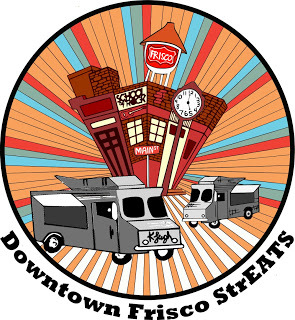 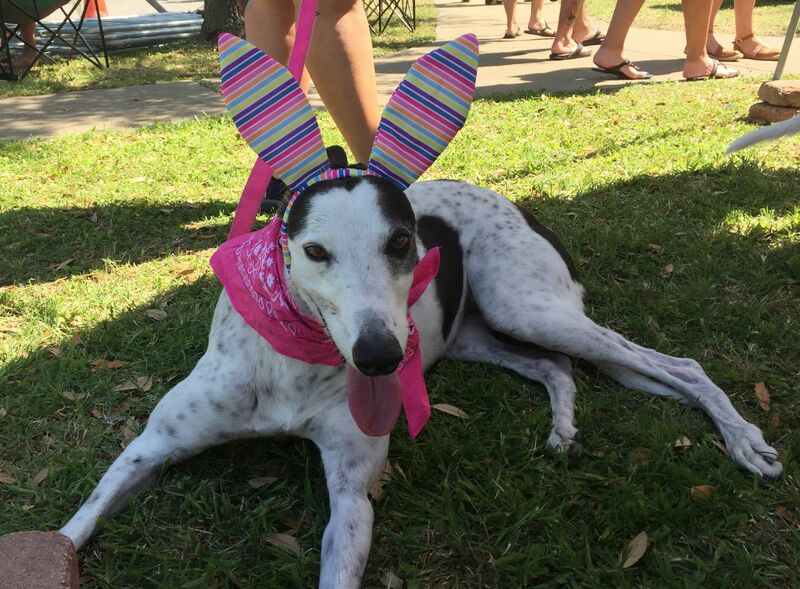 Saturday April 8, 2017 - 2017 Frisco StrEATs: TAGS again showed off the Greyhounds to the public at Frisco StrEATS. 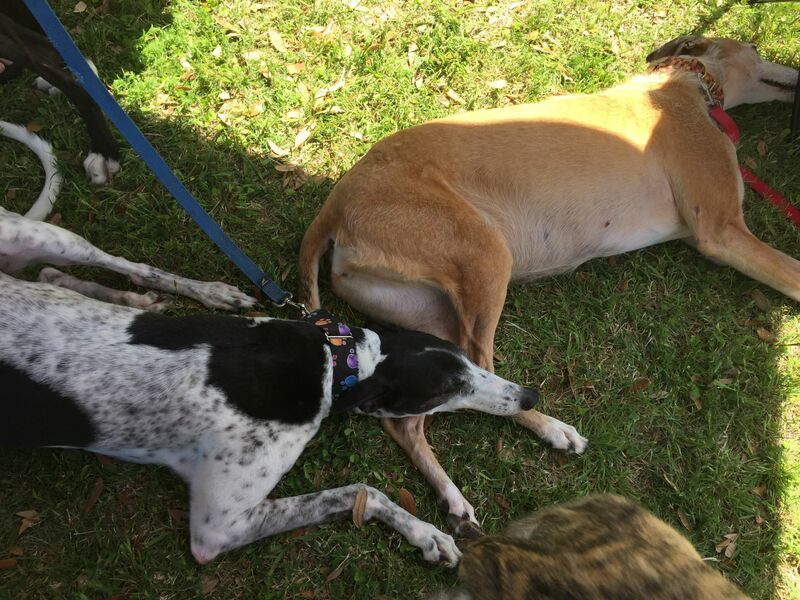 The humans and hounds enjoyed having shade on the warm day and the dogs especially liked being on the grass - a better place to crash. 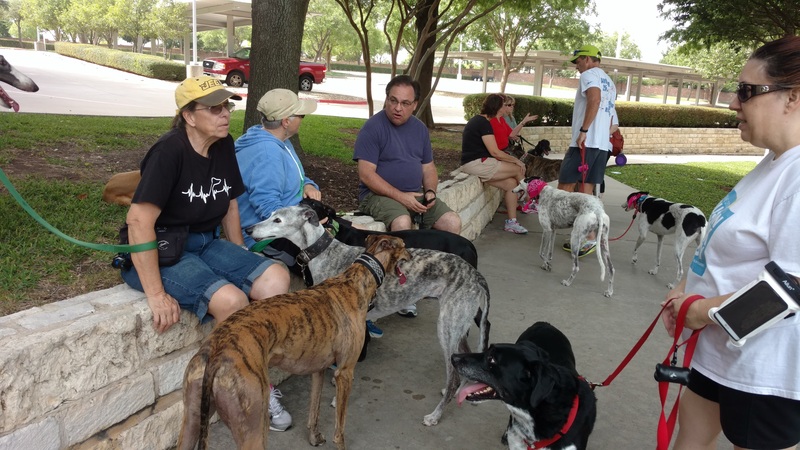 Thanks to all the volunteers. 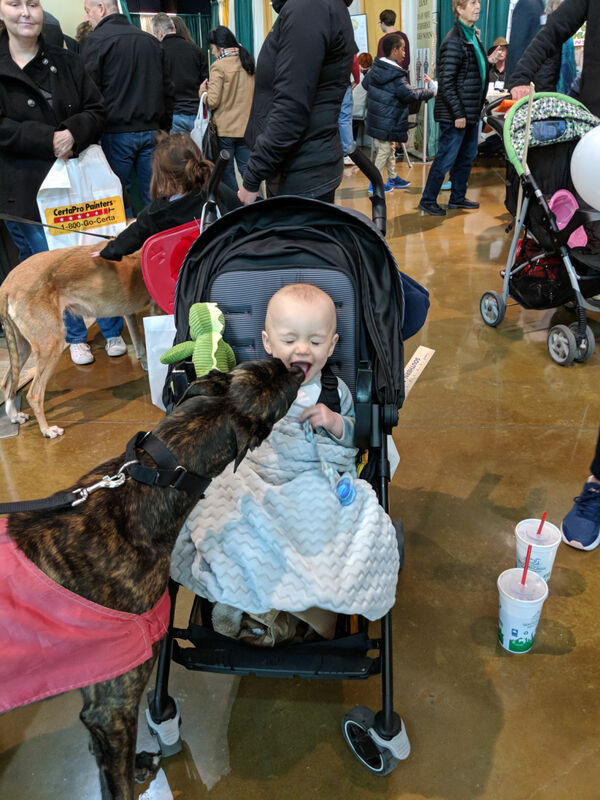 Hope you had fun. 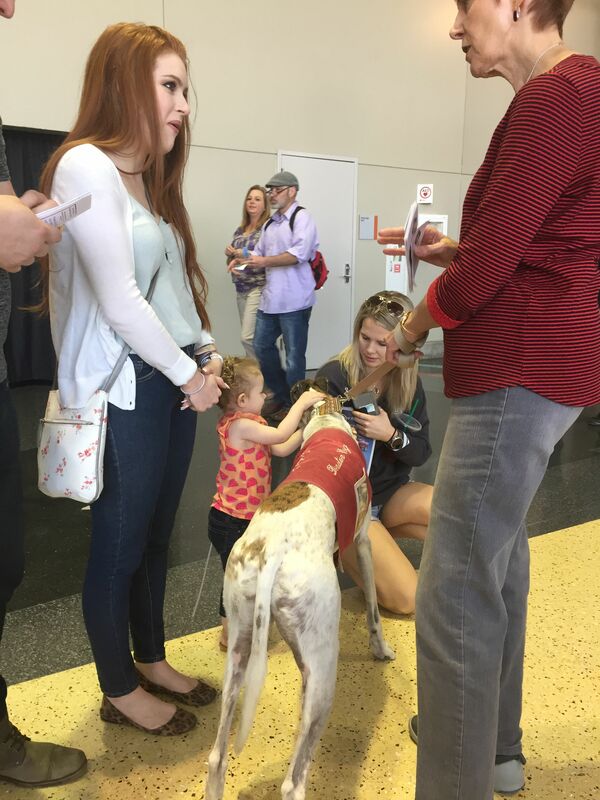 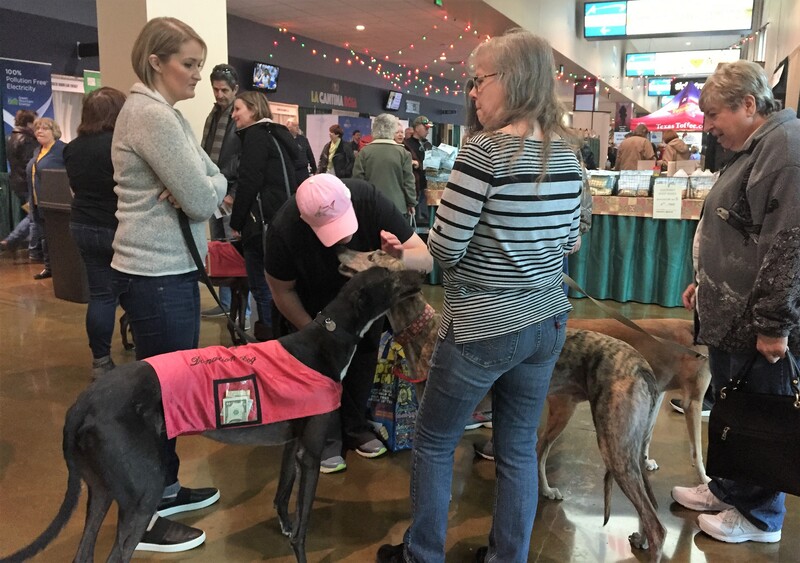 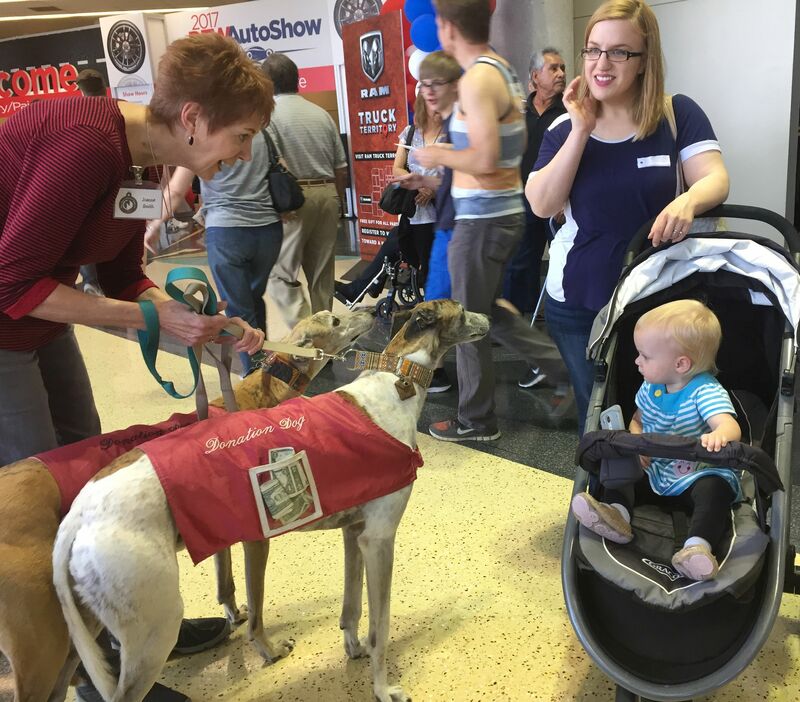 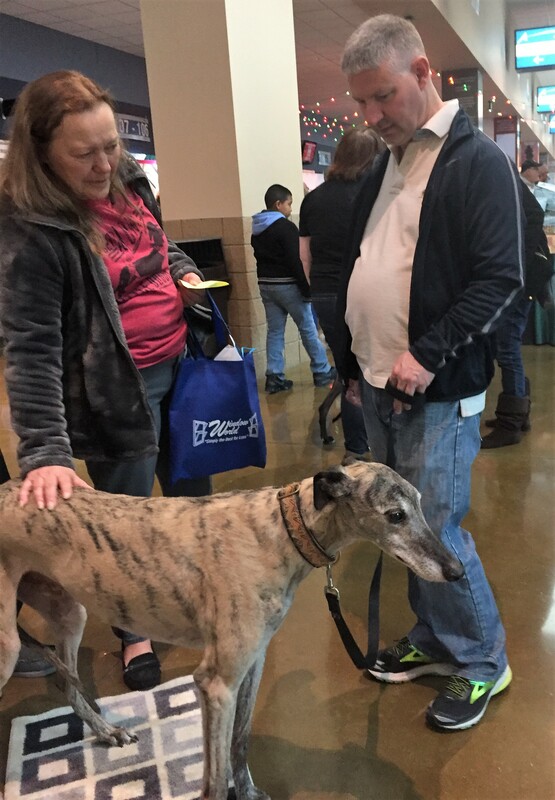 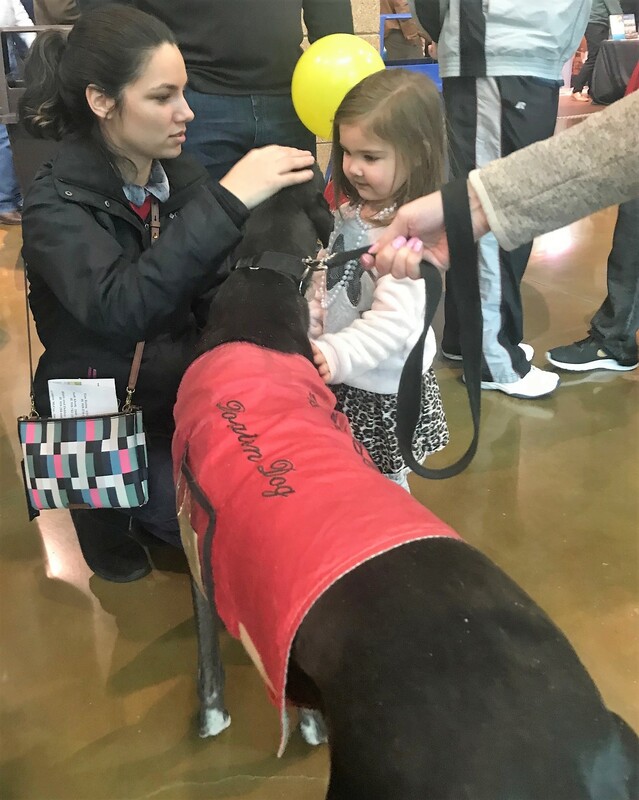 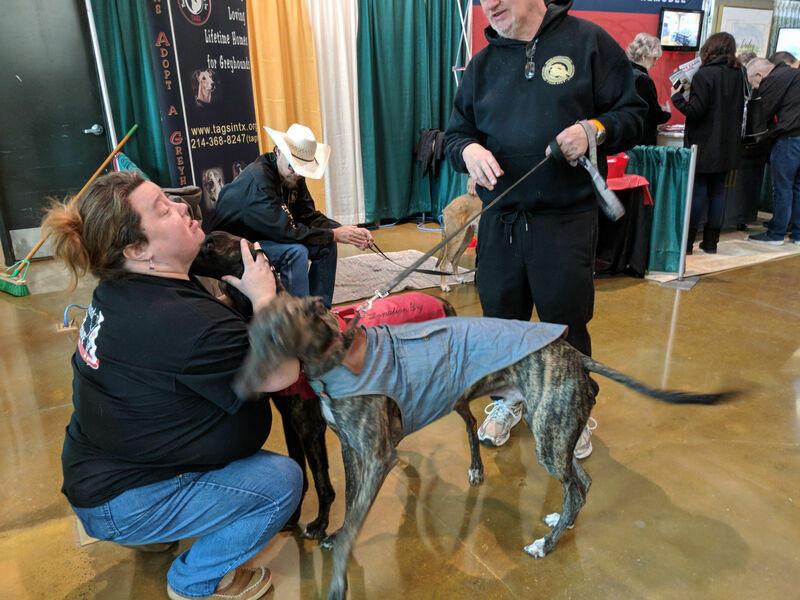 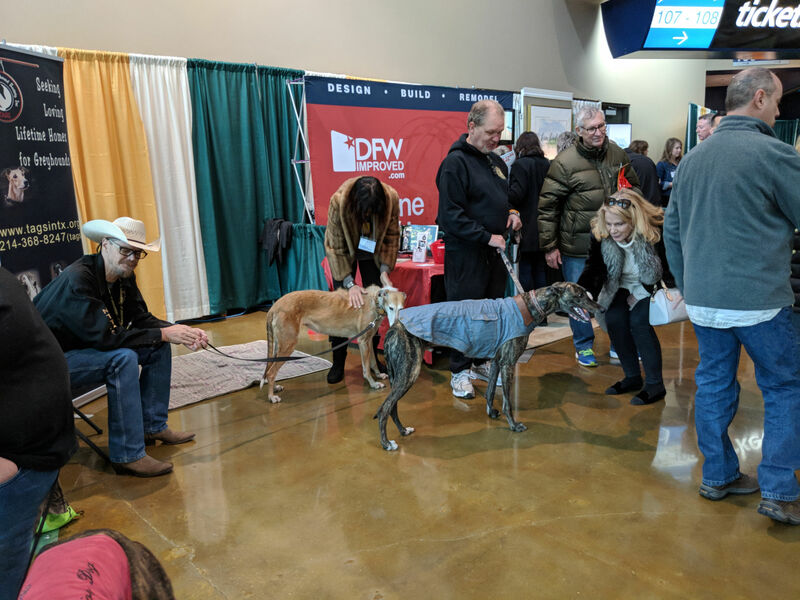 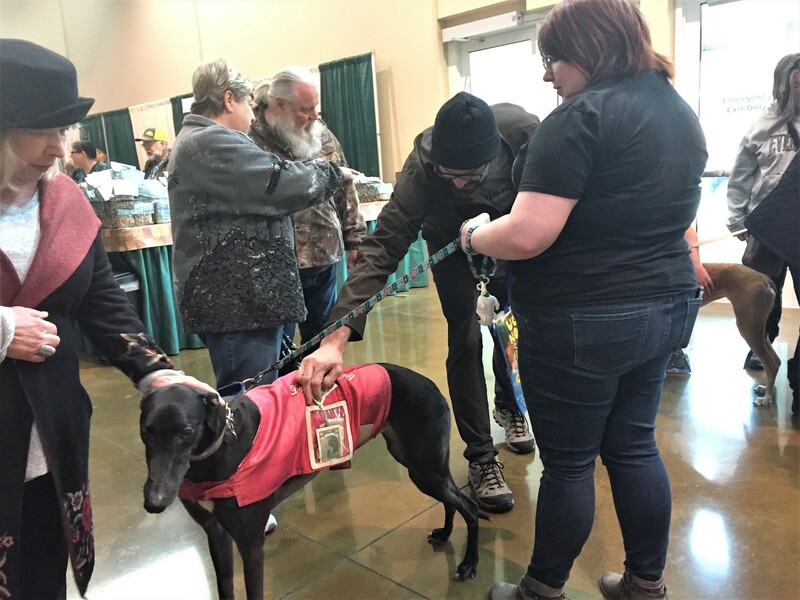 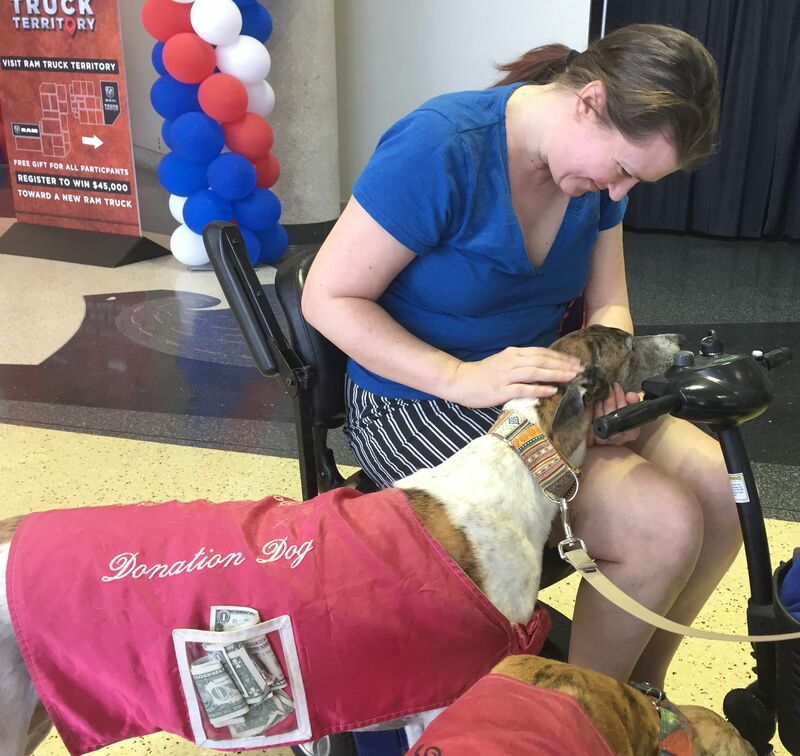 Saturday and Sunday, March 25 and 26, 2017 - 2017 Dallas Auto Show: TAGS’ volunteers braved the Downtown Dallas traffic to bring their Greyhounds to the 2017 Dallas Auto Show. 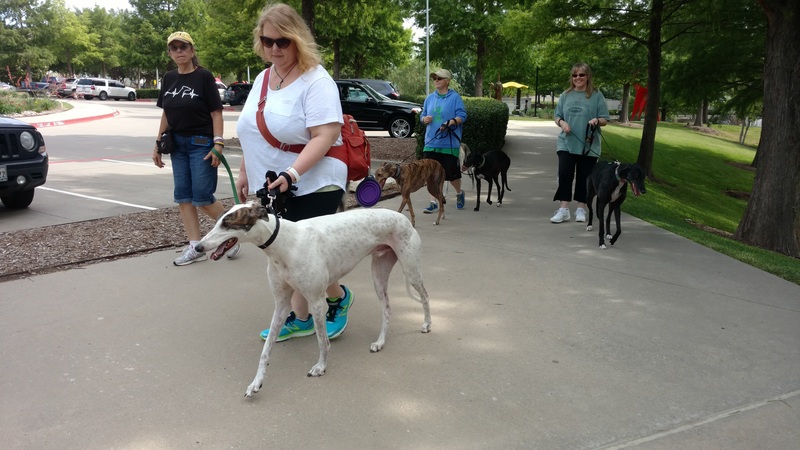 New boy, Spike, made his debut and other TAGS’ dogs made appearances as well. 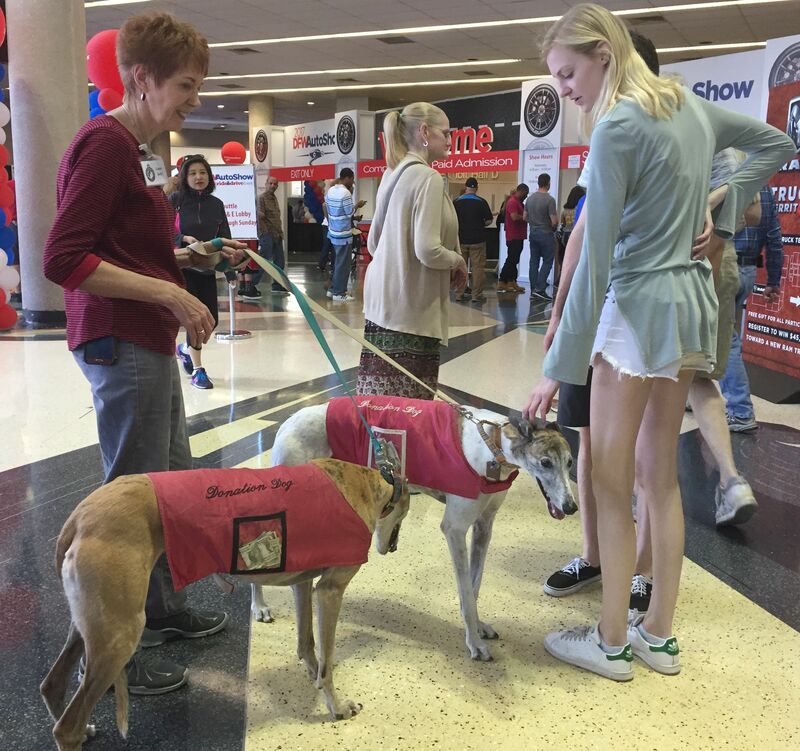 Thanks to all of the volunteers and to the generous public for making this Dallas Auto Show another successful event for TAGS.